Sunday, 30th July, saw the annual match between sides representing the President and Chairman of the club. On a warm but windy day we played one triples and two rinks. The two rinks were very closely fought, with neither side giving any quarter. The triple was also hard fought. The end result was that the Chairman’s team won two of the three rinks, but the President’s team won on points. Everyone enjoyed the match and we look forward to next year. In the photos below, Tony Oldland, Club President, is receiving the trophy from David Matthews, Club Chairman. 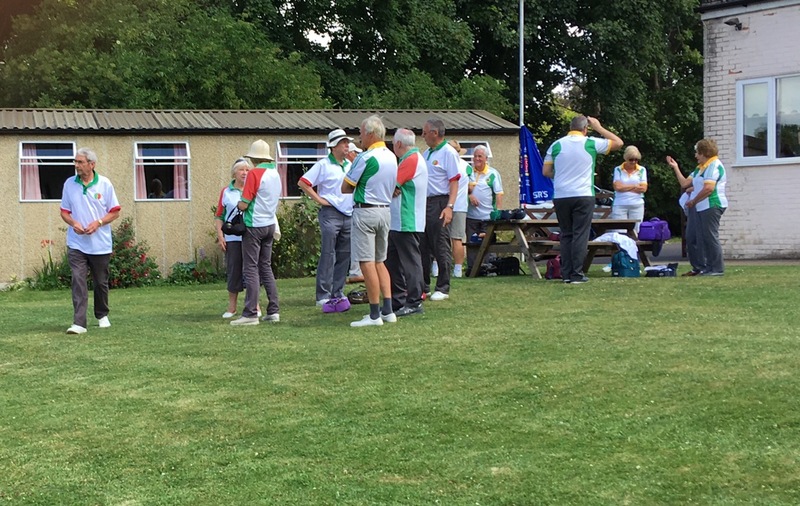 Merrow entertained Westfield on Sunday, 16th July for a match of three triples. A dry but humid afternoon beckoned and, although a brief light shower did come over, we were lucky with the weather. Due to last-minute withdrawals, both sides fielded teams of nine players, allowing us to play three rinks of triples. A very strong Westfield side made Merrow work hard for every point. Westfield won two of the three rinks, with the margin on two rinks being just a single point; one to Mwerrow and one to Westfield. Sadly, your correspondent did less well, losing by a larger margin. The final points total was Merrow 36, Westfield 49. On a very hot and humid day, the half-time break was very welcome. Tea and homemade cakes were very well received by both teams. This was our first fixture with Westfield, and both sides agreed that further matches would be a good idea, so next year should see both home and away fixtures with Westfield. On the evening of Wednesday, 12th July, Merrow played a friendly of four triples at Holloway Hill. Although the day had not been promising following early rain, the evening proved to be warm and dry. However, the earlier rain did make the green a little heavy and difficult to read. The match was played with a great deal of effort from both sides, with Holloway Hill coming out on top, winning on three rinks and also on points; 66 -57. Congratulations to Captain Brian and his team of Ken and Lesley, who were our only winners. A true Captain’s game! 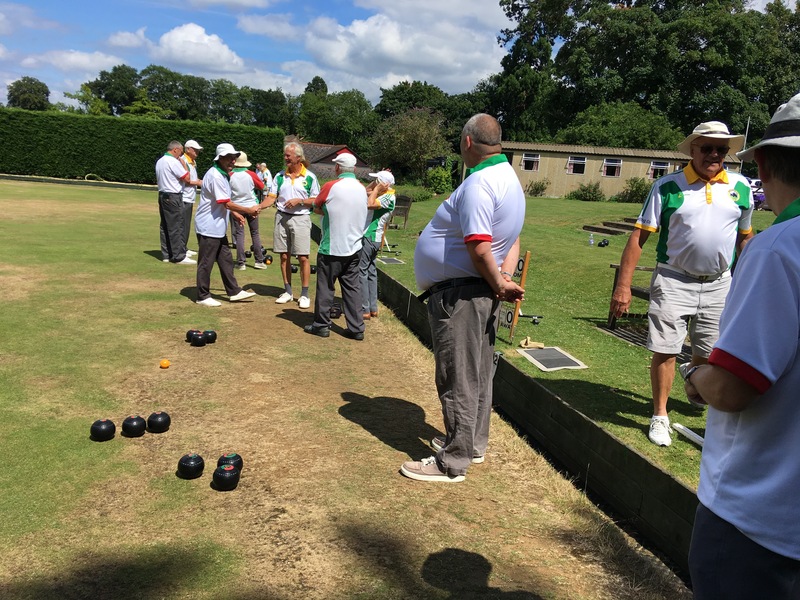 On Saturday Merrow entertained Stoke Park for a three rinks match; that’s four players per team, playing with two bowls each over twenty one ends. This was a departure from Merrow’s normal playing of triples over eighteen ends. Stoke Park are a new side, being the result of a merger of Astolat and Guildford clubs. You may recall that the day continued the recent baking hot trend. Hats were de rigour, as was plenty of liquid intake. The match seesawed a little at the start but all of Merrow’s rinks moved ahead. However, Stoke Park’s captain and his team were always in contention, winning on his rink. The final score was: Merrow winning on two of the three rinks and overall 65 – 51 on points. At the break, Rodney provided delicious homemade cakes and refreshing cups of tea for all, which was very well received. No photos from this match I’m afraid, as my camera was left at home! Mayford Hall – phew, what a scorcher! On Wednesday, 5th July, Merrow hosted Mayford Hall for three rinks of triples. Mayford could only raise eight players, so your correspondent was drafted in to their team. Just when you thought it couldn’t get any hotter, it did! The temperature must have been in the mid-30s on the green. Due to one of the Mayford players being taken ill during the match Lesley kindly stepped in as a replacement. Despite my best efforts on rink three, Merrow managed handsome wins on all three rinks, with an overall points total of 73 – 35. However, I must commend our visitors for giving us a very friendly and sporting match. Thanks to Brian Reigate for providing much needed refreshments at the break! On Saturday, 1st July, Merrow entertained Ripley for the first of two fixtures. On a hot day, the two sides lined up for four rinks of triples. This was a match that, as captain, I was not expecting to win. With each side doing their best, honours were even, with two rinks each. However, Merrow ran out as overall winners 83-51. Half time teas were provided by Anne and Tony, with Anne’s cakes going down a storm with everyone. This was a very friendly match, played in good spirits and we look forward to visiting Ripley for the return match.